This year’s survey showed an alarming 6% decrease in the number of heavy buyers, further offset by a 4% rise in light buyers as well as a 3% increase in the number of women who claim to buy no cosmetics whatsoever. 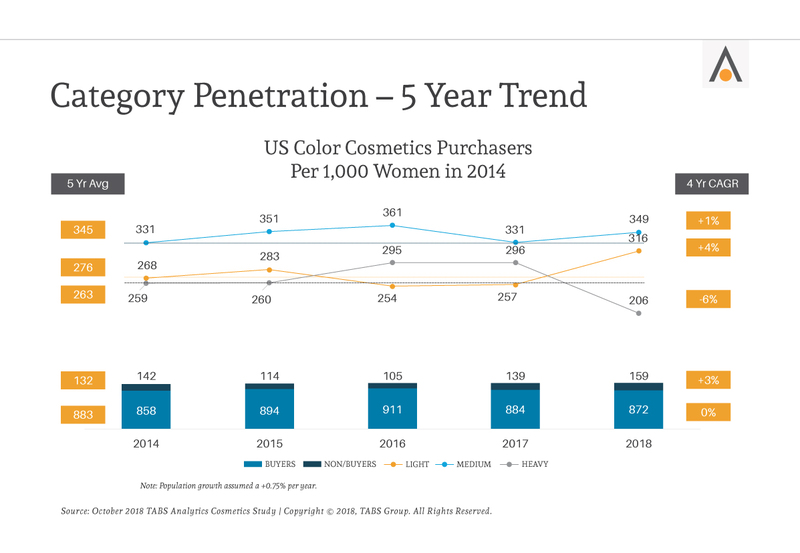 If this trend against heavy purchasing continues and more women choose to eschew cosmetics purchases altogether, the result can mean a sharp downturn in cosmetics market growth. So, Who Are the Heavy Buyers Impacting the Market? The heaviest buyers are concentrated among younger (18-34) consumers with higher income who are Hispanic and non-Hispanic black. 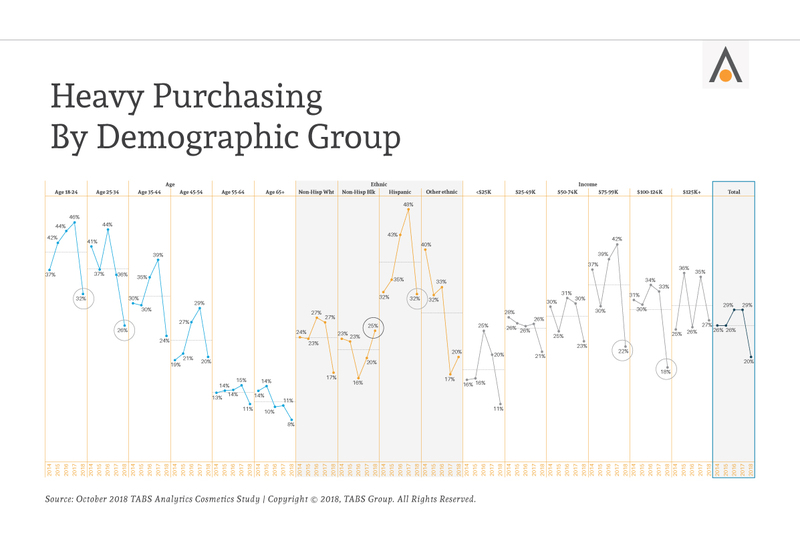 The drop in heavy buying is consistent with an overall decline in purchasing across age, ethnicity, and income level with the exception of the non-Hispanic black category, which shows continued upward momentum. All 20 products assessed in this survey have seen a purchasing decline that’s continued over the past two years, further reinforcing the idea of a trending downturn. 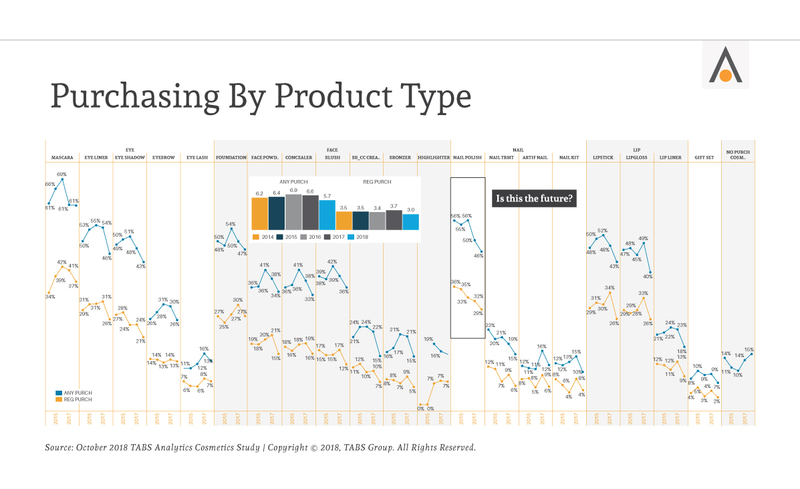 This year, however, product types that are being purchased regularly have seen an overall drop of 19%, capped by a widespread decline (14%) of consumers purchasing any cosmetics. These complementary products comprise items such as blush, concealer, lip liner and gloss, eye shadow and artificial nails. While all complementary products saw some decline, one of the most impacted categories of complementary products is the nail category. Nails have gone from a hot market in 2014 and 2015 with high-growth penetration and saturation, and an influx of expanded product lines and new brands, to a category in free fall. What does stand out in this trend, however, is that the most significant declines in purchasing across categories are seen among heavy buyers. 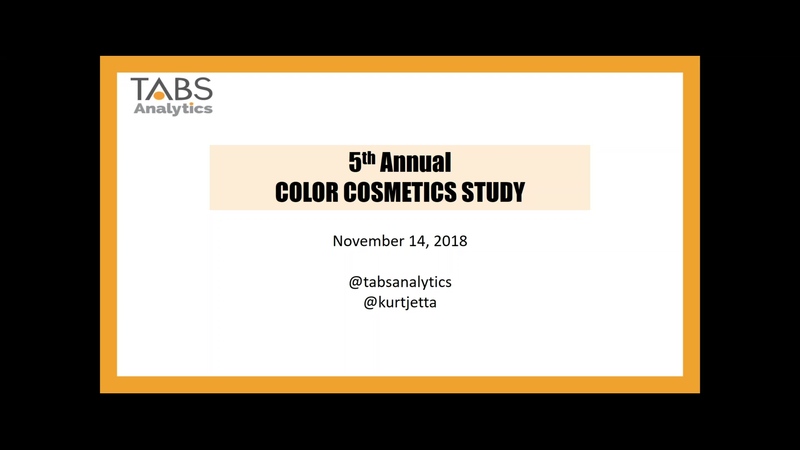 This trend could be more serious in the long run, perhaps indicating that continuing consumer behavior shifts could take the cosmetics market deeper into recession. Not surprisingly, e-commerce is gaining traction in cosmetics market share. 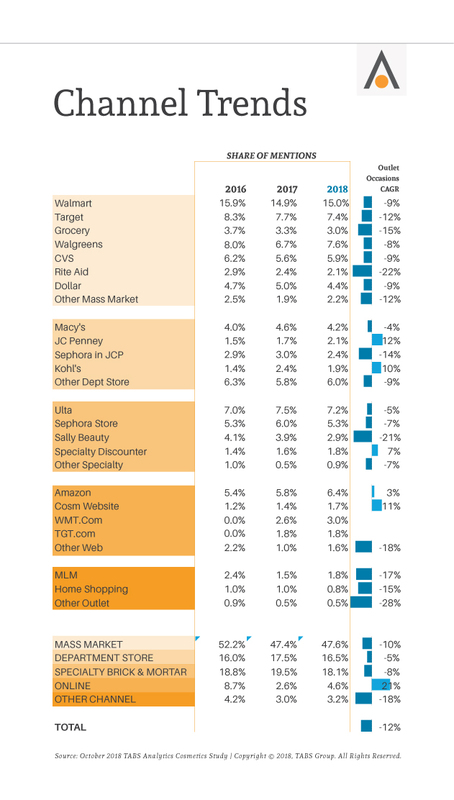 Amazon, specialty cosmetics websites, and Walmart.com all saw meaningful increases in share year-over-year. Amazon saw a 3% compound annual growth rate (CAGR), while cosmetics websites, in general, saw 11% growth over the past two years. Underscoring the success of e-commerce for marketing cosmetics products, the e-commerce arm of retail giant Walmart, Walmart.com, expanded 15% year over year. In the meantime, brick-and-mortar establishments saw a marked decrease in cosmetics purchasing, even though most sales (80%) are still conducted in a brick-and-mortar environment. E-commerce is affecting the cosmetics market in other ways as well, as Dr. Jetta points out. In other words, the combination of a shift to online buying coupled with weak deals in that arena are combining to soften engagement across the board. However, heavy buyers still like to experience their products in a store, so e-commerce is unlikely to threaten brick-and-mortars for the time being. Even high-profile, hot specialty cosmetics outlets like Sephora and Ulta suffered flat activity or worse. This is most likely due to their reliance on heavy buyers, who are curtailing their cosmetics purchases year-over-year. There were other challenges noted in the cosmetic market with makeup-heavy Rite Aid closing stores, Sally Beauty reporting problems via their annual reports, and even mega-retailer Target seeing a slight (.3%) decline. The only high points among brick-and-mortar retailers were centered on CVS and Walgreens, which saw trending upticks. While other elements like confusing cosmetic counter layouts and difficulty selecting brands among a heavily-competitive market do factor into the mix, lack of engagement and changing attitudes account for most of the market’s declining profitability. It’s obvious from this graphic showing year-over-year data for 2017-18 that heavy buyers are still seeking out deals while the rest of the market remains less concerned with them. Consumers on average are spending less time searching for a good deal and hanging around cosmetics counters where a savvy salesperson can talk them into a purchase. 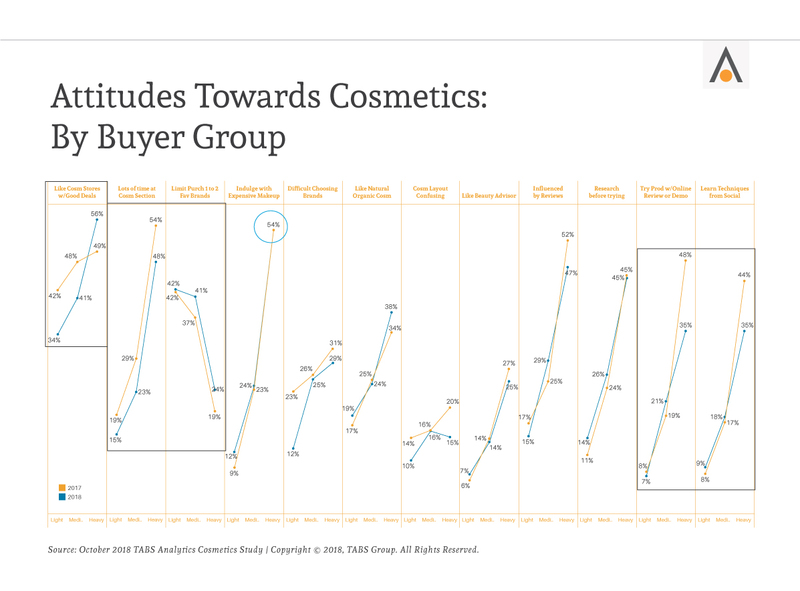 And, while those heavy, deal-seeking buyers still view cosmetics as an indulgence, the numbers of other cosmetic purchasers that see it this way dropped sharply by 30% during the same time period. Now, when we compare the attitudes of heavy buyers against all buyers in a five-year trend analysis, there’s even more evidence that attitudes towards deals are affecting consumer engagement. Deal activity peaked two or three years ago and since then, there’s been an 11% decline in the number of buyers seeking deals. That being said, there was a spike among those heavy buyers that suggest consumers who purchase multiple products still search for ways to grab items at the optimal price. Finally, the shift to e-commerce of the cosmetics target market is causing engagement to drop as customers can no longer experiment with, try on, or otherwise experience the products in real life. 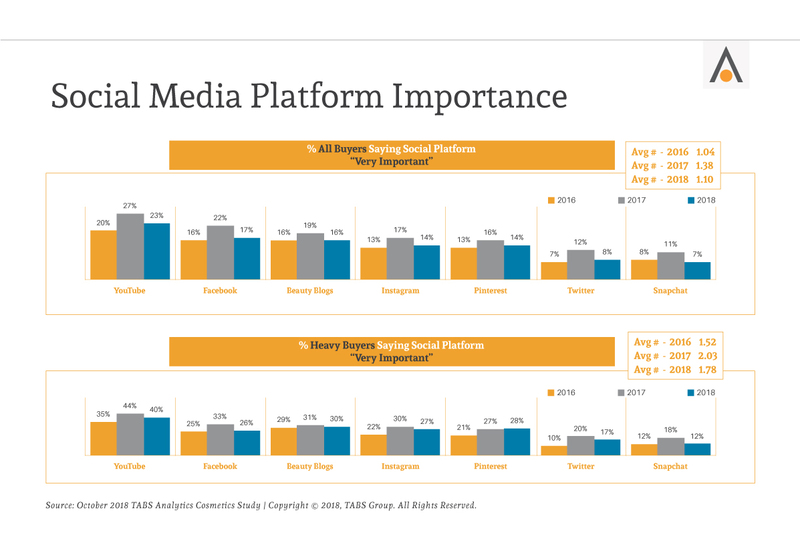 While 60% of buyers say they consider at least one social media platform as “very important” in making purchasing decisions, the overall level of reliance on social media declined in 2018 compared to 2017. This is most likely due to a decline in medium buyers and an increase of light buyers. 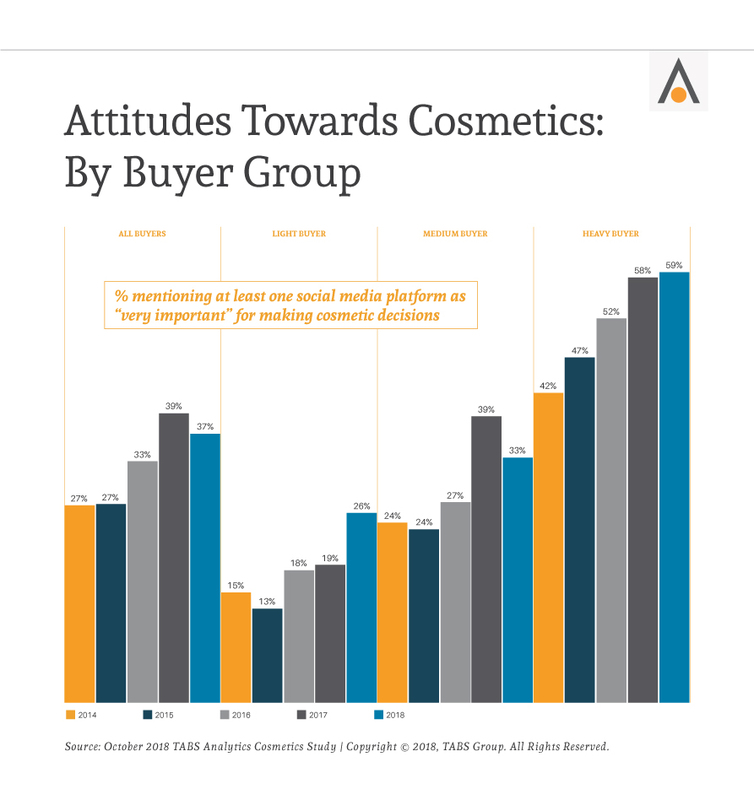 Specific YouTube and beauty blogs still hold importance for a certain population of cosmetic consumers, but overall, shoppers are not turning to multiple social media platforms for information regarding cosmetics. In fact, the number of visited platforms fell from 2017-2018, with social media giants Twitter, Facebook, and Snapchat declining fastest. One place where heavy users are in alignment with other users is that they are less likely to learn techniques or try products with online reviews and demonstrations from their preferred social media platforms. That means that online personalities are having significantly less influence in getting consumers to purchase brands in the cosmetics market. Even heavy buyers are leaving influencers behind, as there was a 9% drop year-over-year in heavy buyers who are learning techniques from social media. How is Makeup Making Out Overall? 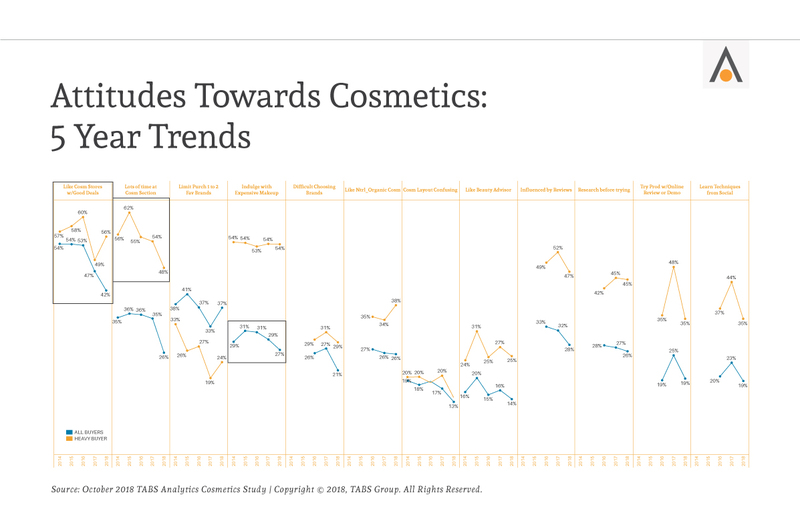 It’s clear from our data that the cosmetics market is entering a time of recession that can be expected to last for several years. While there is still some healthy purchasing occurring particularly when we delve into cosmetic market segmentation and break out the heavy buying groups, there is concern in some areas. The trends in the once-hot nail color segment provide insight into how the overall category will fare in the coming years. 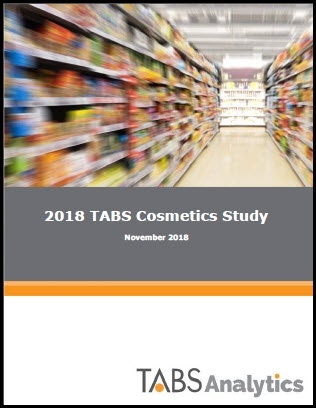 TABS’ surveys have a strong track record as a bellwether of shifting trends, so retailers and manufacturers should take cosmetic market analysis into consideration when determining a cosmetics marketing strategy in the coming months. Exact causes of declines in the cosmetic market are unknown, but viable hypotheses include less excitement over deals and lack of engagement is reducing overall demand. Higher pricing has resulted in saturation. Demand among heavy buyers has not materialized, and women are purchasing fewer product types, converting themselves from medium to light buyers. There has been a general shift in consumer preference back to apparel or other forms of discretionary spending. TABS believes this is the substitution effect – as cosmetics were going strong, apparel sales were weak. TABS does not have empirical evidence of this, as there could be other forms of discretionary spending taking place now, as well. More than 80% of transactions are still at brick-and-mortar retailers. E-commerce may continue to gain, but will not be predominant since heavy buyers like to engage directly with products. Now is not the time for acquisitions or major transactions in the cosmetics space in the U.S., since this is a non-growth category for the next two to three years. Established brands should rationalize their line, particularly complementary products. Given lower sales, retailers will likely reduce space over the next 12 to 18 months to be as productive as possible. They will want to carry only proven products that generate sales and maintain the productivity of existing items. Innovation for the sake of innovation would be counterproductive in this environment since 50+% turnover of the line is not a requirement with the consumer. Solid revenue management practices become much more important in a recessionary environment. In a hot market, there was a lot of focus on image, fashion, and advertising. In a recessionary environment, that will shift to basic blocking and tackling – optimizing pricing, getting the mix correct, and establishing appropriate promotional strategies. Those in the financial sector should limit exposure to beauty investments in the short-term.